Organizations have become deeply dependent on their IT infrastructure and digital data for everyday operations and business success. At the same time, risks affecting business continuity have increased, taking the form of Internet-based attacks, natural disasters, geo-political insecurity, or failure of some critical aspect of increasingly complex IT infrastructure. Recent studies show that more than 60% of companies do not have a Disaster Recovery (DR) plan and 40% of those who do believe it would not be very effective in case of a serious disaster. Conventional approaches to Disaster Recovery are both expensive and somewhat inelegant. They all revolve around replicating production data centers and storage facilities in remote locations to mitigate the risk of a serious event that would affect business continuity. The costs of the data center are also duplicated: data from virtualized environments is copied to back-up storage, and a second set of servers are provisioned for the purpose of quickly recovering operations, but mostly stay idle while waiting for a DR event that one hopes will never take place. It amounts to paying a hefty insurance premium, one that is equal to a substantial portion of the value of the protected asset. What makes matters even more complicated is that the DR site must evolve with the production data center in order to maintain survivability of all components. The consequence is that the costs of a conventional DR site keep growing while remaining in stand-by mode. 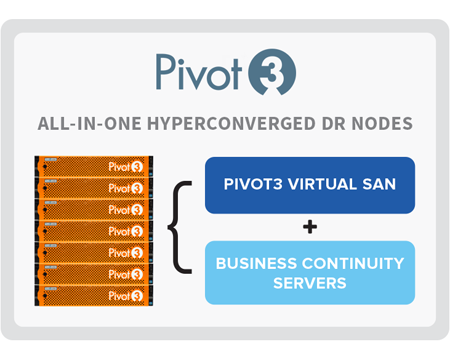 The Pivot3 hyperconverged Disaster Recovery solution solves the disaster recovery challenge with the same disruptive technology that is revolutionizing data centers on the production side. Pivot3 supports fast, flexible, and reliable backup and recovery of virtualized applications and data based on Pivot3’s hyperconverged technology. Critical operations can be recovered to the same back-up appliances to form a robust and cost-effective business continuity solution, rather than replicating an entire data center 1-to-1. Efficiency – Unlike replication-based backup architectures, the storage efficiency of Pivot3 nodes increase with each added node to up to 94 percent. Two-in-One – Disaster Recovery and Business Continuity in the same hardware with no need for separate recovery servers to quickly restore critical operations from the same rack of nodes. Pay-As-You-Grow Capacity Scaling – With conventional SANs, scaling backup capacity represents a major investment and much of new capacity remains unused for some time. With Pivot3, back-up capacity scales one node at a time. No Deduplication Required – Pivot3's Scalar Erasure Coding provides up to 94% of total installed storage capacity making inline deduplication an unnecessary burden on processing power. Flexibility – Each Pivot3 hyperconverged node is an optimized VMware ESXi virtual server environment, so you can run any backup and disaster recovery software including VMware, Veeam, Zerto, and Commvault. Investment Protection – Hyperconverged nodes scale linearly, eliminating the need to over-invest in backup capacity to prepare for growth, so you can focus on business outcomes rather than disaster recovery planning. 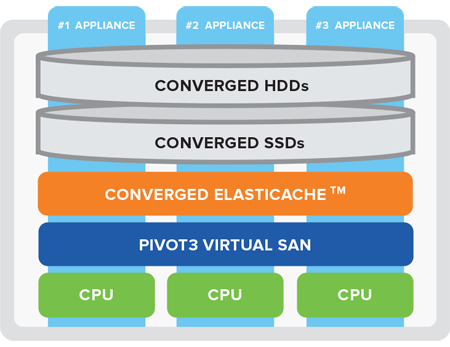 An array of Hyperconverged Disaster Recovery nodes is protected by exceptional fault tolerance inherent to Pivot3’s Hyperconverged Infrastructure technology, which makes the system capable of withstanding the simultaneous failure of an entire appliance plus two hard drives, or the simultaneous failure of five hard drives. Nodes scale linearly, expanding backup capacity as new nodes are added to the array. Since they are cluster aware, new resources of the additional node are automatically added to the converged pool. Only general IT expertise is required to create LUNs or activate the recovery process resulting in a reduced exposure from limited availability of deep DR expertise. Nodes flexibly enable aggressive recovery time objectives (RTOs) and very low recovery point objectives (RPOs), and are battle tested in some of the toughest storage environments. It is not necessary to invest in a separate rack of recovery servers to resume operations in case of a DR event. Pivot3’s hyperconverged technology provides ample compute power from within the storage node to power recovery operations this saving server cost, space, and cooling costs. Hyperconverged Disaster Recovery nodes can be combined with a wide selection of business continuity and disaster recovery software solutions to support enterprise-class BCDR plans. Seamlessly replicate virtual or conventional environments to in the DR facility, and continuously backup to Pivot3 nodes in the production data center. Nodes are based on the Pivot3 platform which unifies storage and compute resources on an ESXi hypervisor and enables the DR application to access the entire RAM disk through patented Elasticache. All nodes act as a SAN so the software aggregates all IOPS from the entire cluster to support aggressive RTOs and RPOs.